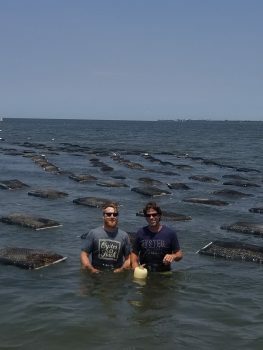 These growers will provide a taste of their delectable oysters at the 2018 Pelican Awards and Taste of the Coast on July 28. 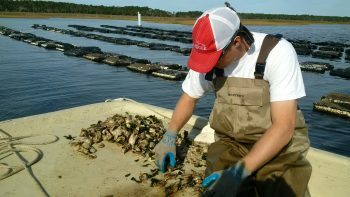 Oyster mariculture is a growing industry in North Carolina, and the state’s oysters are gaining recognition as some of the best around. Get to know the growers as you gear up for this year’s event, and be sure to try all the different types of oysters! 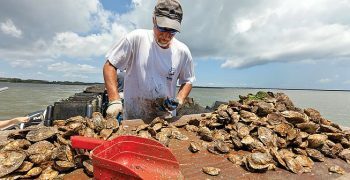 Because they’re coming from all different parts of the coast, the oysters will all have different “merroir.” Merroir is the term used to describe how oysters and other shellfish reflect the taste of the waters where they are grown. You can learn more about North Carolina oysters and read more in-depth profiles at ncoysters.org. Photo courtesy of Jay Styron. 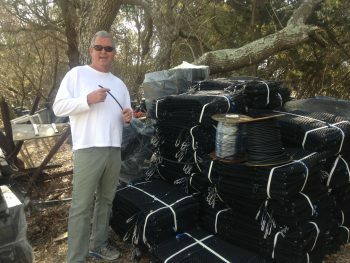 Jay and Jennifer Styron, Carolina Mariculture Co. 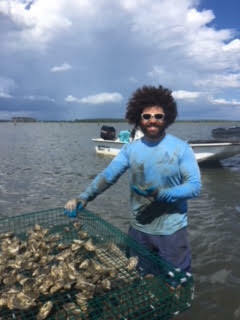 Favorite thing about working at an oyster mariculture operation: Working with my hands on the water, beautiful days. Photo courtesy of Ryan Bethea. Oyster’s merroir (how oysters reflect the taste of the waters where they are grown): I’ve heard people describe them as the saltiest they’ve ever had. Favorite thing about working at an oyster mariculture operation: I take a lot of pride in providing people with fresh, local seafood. My oysters are always harvested on the day they are eaten, and I only sell them in North Carolina. What did you do before growing oysters? I was a bartender then taught at Terrell Lane Middle School in Franklin County for four years. Anything else you would like us to know? 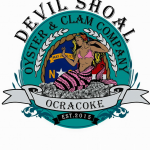 I am proud to have won the 2016 Oyster of the Year at the North Carolina Seafood Festival Shuck, Rattle and Roll event. Read a full profile on Ryan at ncoysters.org. 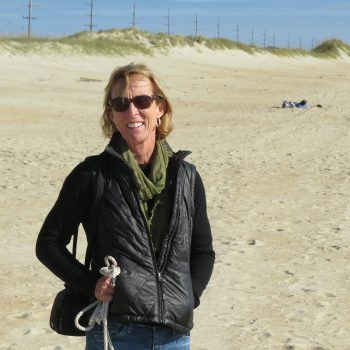 North Carolina Coastal Federation photo. 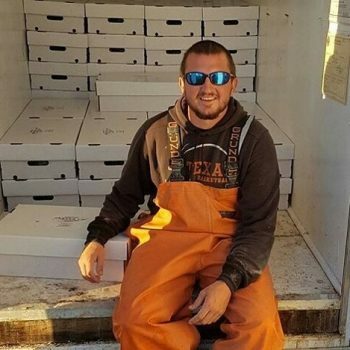 Joey Daniels, Wanchese Fish Co. Favorite thing about working at an oyster mariculture operation: It is never boring. There is always something to learn. What did you do before growing oysters? Vessel maintenance for Wanchese Fish Co.
Photo courtesy of Tom Cannon. 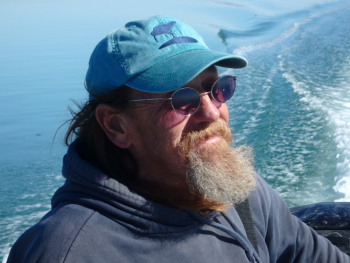 Tom Cannon, Soundside Oyster Co.
What did you do before growing oysters? I work with a local furniture company out of Durham called Bull City Designs to source and sell local and foreign sustainably harvested furniture and furniture materials. Location: We are located at the of the Newport River between Beaufort and Morehead City. Oyster(s): We will be serving our all-natural diploid, Wild Ponies™ oyster. Oyster’s merroir (how oysters reflect the taste of the waters where they are grown): Wild Ponies™ channel the crisp, salty flavor of the Atlantic Ocean mixed with a wholesome sweet flavor imparted from the fresher waters of the upper Newport River that flow over The Lump on falling tides. Favorite thing about working at an oyster mariculture operation: Things: Sunrises… Growing oysters in an environmentally positive manner that promotes responsible resource enhancement, while creating jobs. Photo courtesy of Niels Lindquist. What did you do before growing oysters? 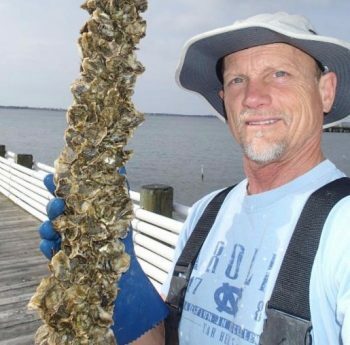 Dr. Niels Lindquist: Co-founder, CEO, Sandbar Oyster Company, has been a professor of marine biology for many years at UNC’s Institute for Marine Science in Morehead City. 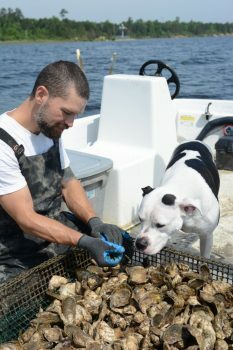 Clammerhead (David Cessna Sr.), Co-founder, V.P., Sandbar Oyster Company, is a seventh generation commercial fisherman. Anything else you would like us to know? 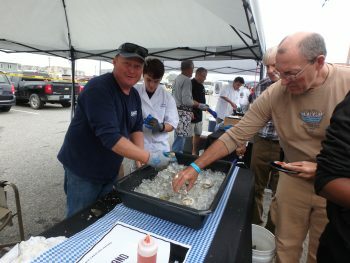 More info about Sandbar Oyster Company can be found at www.sandbaroystercompany.com. Photo courtesy of Ryan Belter. 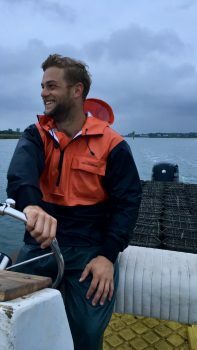 Bill and Ryan Belter, Cape Hatteras Oyster Co.
Oyster’s merroir (how oysters reflect the taste of the waters where they are grown): The salt level is on the medium to salty side with an average salinity reading hanging around 24ppt and sometimes reaching up to 28ppt. Notes of seaweed, crab and mushroom. A clean and mild flavored oyster that’s great for beginners and connoisseurs alike. 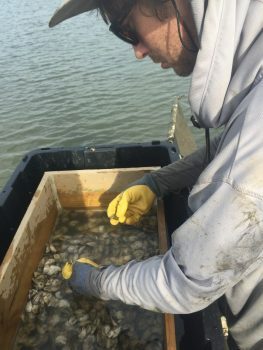 Favorite thing about working at an oyster mariculture operation: Location, freedom to experiment and problem solve, and taking part in the abundant growth of life! Anything else you would like us to know? We’ve documented a lot at @capehatterasoyster on Instagram. Photo courtesy of Kim Schwab. Matt Schwab, Hold Fast Oyster Co. Oyster(s): Stones Bay oysters grown by Hold Fast Oyster Co.
Oyster’s merroir (how oysters reflect the taste of the waters where they are grown): Stones Bay oysters have a moderate salinity with almost truffle-like undertones. 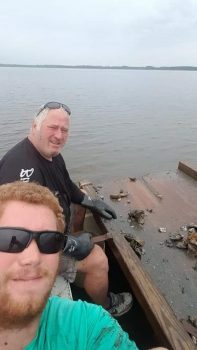 Favorite thing about working at an oyster mariculture operation: Being able to share a connection to the water with people all over that eat oysters. Photo courtesy of Dodie Blakely. 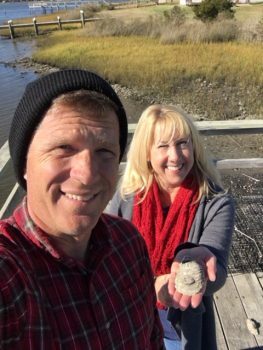 Keith and Dodie Blakely, Sunny Point Oyster Co.
Oyster’s merroir (how oysters reflect the taste of the waters where they are grown): They are salty with a wonderful flavor that is Bogue Sound. Favorite thing about working at an oyster mariculture operation: Too many to pick a favorite! We love that it helps the environment. Not only because of the filtering of the water. That’s great in and of itself, but we also love that our oyster cages are providing habitat for other small creatures. It’s always interesting to see what may be in and around our cages. For me it’s also a sense of history and carrying on of traditions. My family has been in Carteret County since the 1700s and were always involved in agriculture and the sea so I’m proud that our family is continuing that. And when you get to spend a beautiful day on the water, well that is just the icing on the cake! What did you do before growing oysters? Keith was a Harrier pilot in the Marine Corps. He retired in 2015 after 23 years of service. I worked in accounting and management until 2009 when I became a stay-at-home mom. Keith now works for Delta Air Lines, and I’m back into accounting again. Our schedules are flexible, which allows us the time for mariculture. Anything else you would like us to know? I’ve also tried pickling our Oysters and so far have gotten good reviews! Photo courtesy of Conor MacNair. Oyster’s merroir (how oysters reflect the taste of the waters where they are grown): An open ocean salt hits the nose and pallet strong as soon as the shell hits the lips. It quickly sways the taste buds with pallet cloaking salt and butter flavors, which evolve into a salty, sweet and celery-like vegetable finish. What did you do before growing oysters? I earned an undergraduate degree in geological oceanography at the University of North Carolina Wilmington. Spent internships working under Hog Island Oyster Company. Worked as local fishmonger during school and while starting the farm. Oyster’s merroir (how oysters reflect the taste of the waters where they are grown): Our oysters are plump with a good salinity, smooth texture and delicious finish. What did you do before growing oysters? Katherine did consulting work, and Spurgeon is a fisherman. Oyster’s merroir (how oysters reflect the taste of the waters where they are grown): Our oysters have a salty but sweet taste of Core Sound.